Will iOS 7 finally make traditional PCs irrelevant? The key to the next stage of Apple's iOS mobile experience may lie not in the number of changes the company makes to its software but in the kind of changes it makes. By marrying a UI redesign with deeper changes that let iOS handle more complex tasks more easily, Apple can consolidate its position as the definitive post-PC platform. The world will be able to evaluate those changes on Monday, June 10, when Apple reveals iOS 7 at its Worldwide Developers Conference in San Francisco. Over the past week, some details from apparently credible sources indicate that at the least Apple will introduce a new visual style to the user interface layer of the operating system. But unless or until these are married with deeper changes they will remain, precisely, surface changes that by definition will have little impact on the user experience. While there's no lack of specific changes being called for by developers, users and bloggers, it's easy to lose sight of the forest for the trees. The question is whether the specific changes made by Apple are part of an overall plan for sustaining iOS as the definitive post-PC computing platform. "Plan" doesn't mean an unchanging scheme set before the release of the first iPhone in 2007. Rather it means a flexible, disciplined way of constantly questioning how Apple iOS fits with the Apple hardware and services that, together, constitute the "mobile experience" for Apple users. This marriage of visual UI changes and underlying OS changes also has some direct implications for one subset of Apple users: those in the enterprise. The iOS 7 UI changes, such as those described by Mark Gurman's reporting for 9to5Mac, suggest that Apple Senior Vice President for Industrial Design Jonathan Ive is looking to create more visual consistency, based on a simplified layout and color palette, that dispenses with visual cues of textures and shadings. Part of this approach also could be minimizing and simplifying the pixel-eating "chrome" that surrounds onscreen information. Together, these changes can form a new surface style that can improve navigation, which requires knowing both where you are and where you're going, and in this case, what you're doing and what you want to do. The "doing" aspect of UI design calls for reaching beneath the surface to the underlying kernel. One way to think about the deeper changes is suggested by Fraser Speirs in a recent blog post. Speirs (@fraserspeirs) is the head of computing and IT at Cedars School of Excellence, "the world's first 1:1 iPad school," in Greenock, Scotland. He is an Apple distinguished educator, Apple education mentor and Apple professional development trainer. He shares the Out of School blog and podcasting site -- "the intersection of technology and education" -- with Bradley Chambers, director of information technology for Brainerd Baptist School, Chattanooga, Tenn.
iMore: iMore's top iOS 7 wants! Macworld: How much will Apple change iOS and OS X? What sets Speirs' analysis apart is his perspective: "iOS broke through a lot of conventional wisdom about how computers should appear and operate," he writes. iOS "broke the tyranny of the hierarchical filesystem as a user interface." It "turned the purchase and installation of third-party software from a great opportunity to destroy your computer into something that people do for fun. People of very low technical ability are now perfectly safely and competently administering their own computers." Finally, "iOS solved the virus problem." Speirs argues in another recent post that thinking of computing devices in terms of "content vs. consumption" is far too simplistic. "It recognizes almost nothing about the user's task beyond whether it's an input task or an output task," he says. A better way of thinking about devices is in terms of the task's complexity and duration. Duration means "how long of a continuous period will you be using your device for the task." Complexity is more ... well, complex. It involves variables such as: number of steps to finish the task, whether the steps are linear or not, the extent to which the task combines data from multiple sources, and the amount of data. To illustrate this, Speirs created a chart. iMore Editor-in-Chief Rene Ritchie has a somewhat similar perspective, which surfaces in his series of posts, since the iOS 6 release in fall 2012, on how and why iOS 7 needs to be different. In one, on improving iOS file handling, he talks about how a smart document picker for iOS would "remove the cognitive burden from users and let the system do all the heavy lifting." Another example is a more recent post, on how the iOS Notification Center can "transition from informational alerts to actionable ones." In effect, Ritchie describes an OS that, instead of simply providing a (lengthy) sequence of discrete actions that a user follows to complete a task, actually cooperates with the user. "Imagine instead that, once the banner notification rolls down, we could not only tap on it to go to the app, but drag it down to get an actionable dialog," he explains. "Then we could quickly enter and send a response, at which point the dialog would disappear and we could immediately resume what we were doing. No carousel app switching, no need to click and tap our way back." And this brings us to what iOS 7 might reveal about Apple's intentions. Today, says Speirs, iOS "does a wonderful job in the lower-left corner of the chart" -- with light-to-medium complexity tasks, over relatively short durations. 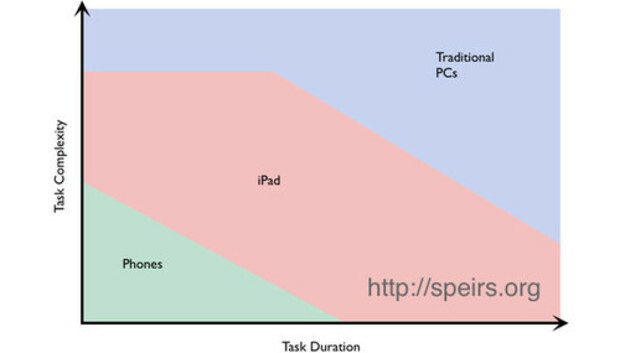 The real opportunity lies in the upper-right corner of Speirs' chart -- enabling iOS to handle new classes of tasks. Problem: "One source of complexity is having to use multiple tools to achieve the result you want. On the desktop, the common transport for doing this is the filesystem: save a file from one app, open it in another. iOS needs to support the user in that task without breaking the filesystem abstraction that has been so valuable in making iOS approachable for less technical users. ... If I want to take a PDF stored in Evernote, edit it with PDF Expert and save a modified version back into the same Evernote note, I simply can't do it today." Solution: "If iOS had a generalized 'send this piece of data to apps that claim to handle it' service - yes, like Android does - all the work to allow posting a link to Flipboard from Tweetbot would be in the hands of Flipboard and not Tweetbot." Easier, more transparent handling of files and non-file data in iOS is a change called for by many others also. Microsoft has a similar service, called contracts, in Windows 8. CodeProject.com has an analysis of how contracts work. Problem: "Moving data between two iOS devices without using a Dropbox-like service, email or, worse, a Mac has always been annoying. Apps like iFiles leverage Open In ... to work around the problem but, again, you end up with a copy of your data in iFiles' sandbox as well as the originating app." Solution: "iOS should support AirDrop, and it should be available as an 'Open In ...' target." AirDrop is Apple's peer-to-peer Wi-Fi connection, apparently based on a subset or customization of the Wi-Fi Direct peer-to-peer standard. It's currently supported in OS X. Just in the last few days, there have been reports that Apple is testing AirDrop for iOS 7. Problem: Big data. "One of the bigger limitations of iOS has always been that, every so often, you'll try and do something that's 'too big' for an iOS device to do. ... Examples include: trying to import a video from the Camera Roll into an app, opening a large Keynote file, applying a complex set of adjustments in iPhoto." Solution: "As CPU, memory and storage levels increase, these issues should diminish but there are clearly some aspects of these that are OS-dependent." Speirs argues that this "conceptually small set of changes," rather than a "ground-up rethink" or changes to make iOS "more like our existing desktop OSes," is what's needed "to satisfy more of the needs of the power user." Monday's WWDC keynote, at 1 p.m. EDT, will reveal to what degree.